Glaciers in the Everest region of the Himalayas could decline by as much as 99 percent by 2100 due to warming temperatures and some could disappear. A team of researchers in Nepal, France and the Netherlands found the glacier volume could decline by 70 percent to 99 percent. Putting historical weather data into eight temperature and precipitation models, they found the extent of decline would depend on how much greenhouse-gas emissions rise and how that affects things such as temperature, rainfall and snowfall. In most of the modeling, the glaciers below 5,500 meters (18,000 feet) could be eliminated by the end of the century while those at 6,000 meters (19,685) would lose their thickness. Further up, glaciers would be less affected. "The signal of future glacier change in the region is clear: continued and possibly accelerated mass loss from glaciers is likely given the projected increase in temperatures," said Joseph Shea, a glacier hydrologist at the International Centre for Integrated Mountain Development (ICIMOD), Kathmandu, Nepal, and leader of a study that appeared in the journal The Cryosphere Wednesday. "No matter which scenario or model type was used, the results were clear: glaciers in the Everest region could see sustained mass loss through the 21st century," Shea added. Increased temperatures affect glaciers in two ways, Shea said. For one, they result in increased melting. They also cause so-called freezing levels - the elevations at which mean monthly temperatures are zero degrees C - to rise higher up the mountain. That results in increased areas exposed to melting and decreases the snow accumulation on the glaciers. "The freezing level currently varies between 3,200 meters (10,498 feet) in January and 5,500 meters (18,000 feet) in August. Based on historical temperature measurements and projected warming to the year 2100, this could increase by 800-1,200 meters," said study co-author Walter Immerzeel of Utrecht University in the Netherlands. "Such an increase would not only reduce snow accumulations over the glaciers, but would also expose over 90 percent of the current glacierized area to melt in the warmer months." Glaciers in High Mountain Asia, a region that includes the Himalayas, contain the largest volume of ice outside the polar regions. 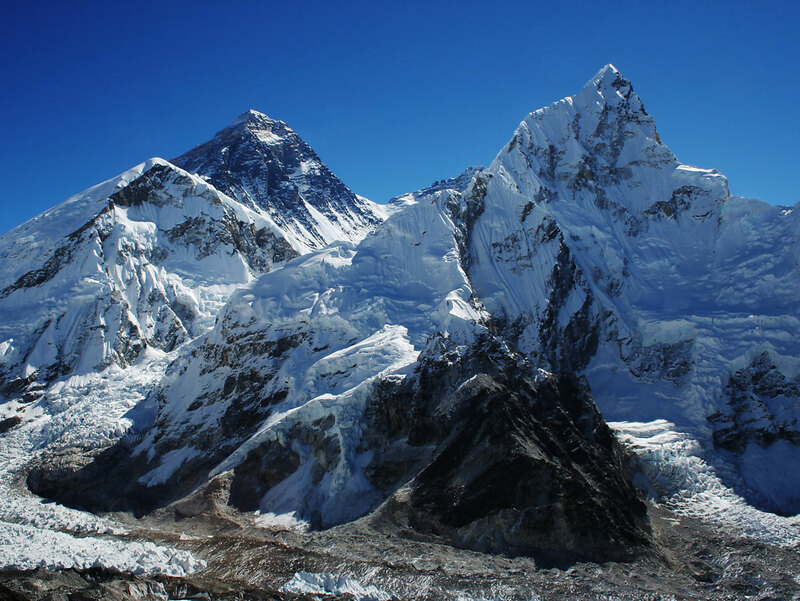 The team studied glaciers in the Dudh Kosi basin in the Nepal Himalaya, which is home to some of the world's highest mountain peaks, including Mount Everest, and to over 400 square kilometers of glacier area. This is the most detailed study on the rate of melting and builds on earlier research that has tracked melting on the world's highest mountain over the past half century. A 2013 study, for example, found that the glaciers in the Mount Everest region have shrunk by 13 percent in the last 50 years. It also found that the snow line in the area has shifted up by 590 feet. Looking ahead, the decline is especially worrisome for the estimated 1.5 billion people who depend on the Himalayan glaciers for everything from a source of drinking water, to irrigation to hydroelectric power. "Apart from the significance of the region, glaciers in the Dudh Kosi basin contribute meltwater to the Kosi River, and glacier changes will affect river flows downstream," Shea said. In the short term, the region may benefit as the melting glaciers increases water flows. But over time, the reduced meltwater especially during the warmer months will pose challenges before the monsoon rains arrive. The rapid melting also poses a danger for communities living below these glaciers, as it results in the formation of increasing numbers of glacial lakes dammed by debris, which have been known to burst their banks and cause widespread flooding, with river flows 100 times greater than normal.